Not everyone can quite suppress that involuntary ‘wow’ that emerges from their mouths when they get up here – this is the Singapore River from and all-new angle. 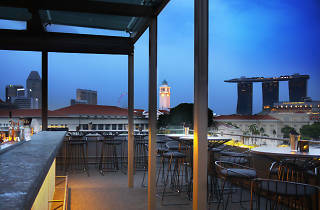 Placed on the South Bridge Road end of the Boat Quay stretch, this outdoor bar that has surfaced on a shophouse rooftop overwhelms the eyes with an unobstructed panorama of the Parliament buildings, skyscraper columns, Marina Bay Sands, and even the top half of the Flyer. Finding it, though, will be your first challenge. 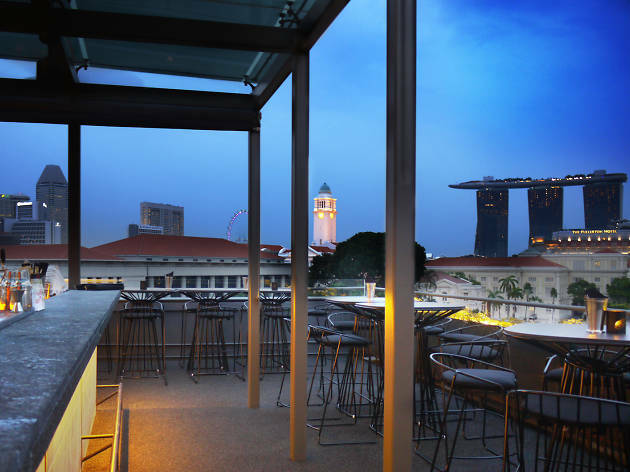 Disregard its Boat Quay address and look for the illuminated lobby in the alleyway along South Bridge Road to take the glass-cased lift up to the fifth-floor perch. The partially sheltered outdoor bar seats 36 and has standing room for double that number around its built-up kitchen and bar – though if you’re tallish and have a penchant to throw shapes after a few drinks, give the alarmingly short surrounding walls a wide berth. Where Southbridge earns points for its vantage point, it loses for the food. For a kitchen run by il Lido group honcho Beppe De Vito, we certainly didn’t expect an almost tasteless lobster knuckle roll ($28) among the seafood snack options. The oyster angle is played out six ways hot ($30/six) and cold ($20/six at happy hour, $24/six after 8pm), with dressings like ponzu in the umami version, mint cucumber and vermouth in the habana, and smoked bacon and cheese in the smoky casino. The bivalves are from New Zealand, and will occasionally include a selection of rarer French Belon and Irish Rock shells. On the menu are reasonably priced 30-strong, fruit-forward drinks fortified by mostly small-batch spirits ($15-$22). The bar is well-capable of mixing up a robust Old Fashioned if romantic views need to be savoured with liquid gravitas, and cocktails like the Southern Belle ($18) with berries, strawberry, caramel, lemon and chamomile-perfumed whisky, or the Mon Cherie ($18) with champagne, vanilla vodka and cacao liquer ($18) will ensure that a date here will end on the right note. The place is a total rip off. On New Year's Eve, at 11.50 pm they charged me 150 SGD cover charge (3 people) to go in and at 5 minutes past midnight (15 minutes later) they told me they were closing because their license does not allow to stay open after midnight. Don't spend your money here. There are a lot of places in Singapore who do treat a customer correctly.